Soundbrenner Core aims to revolutionize practice for musicians. It brings all of your most essential music tools under one roof. The smartwatch functions as a tuner, vibrating metronome and a decibel meter. And yes, it tells the time as well and can even receive push and calls notifications from a user’s smartphone. The gizmo builds on other innovative products from the Hong Kong-based startup. One of these is Soundbrenner Pulse, a vibrating, wrist-worn metronome. 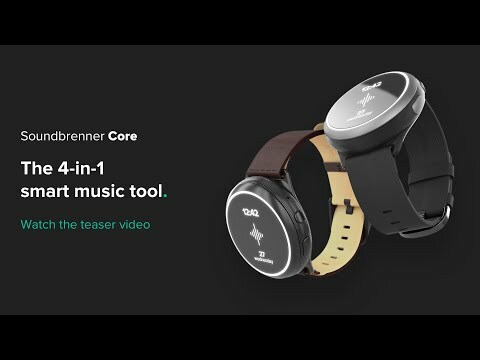 Soundbrenner Core slaps additional functionality to the smartwatch, expanding it into a much more useful 4 in 1 smart music tool. A musicians Swiss-knife, the device allows users to delve into rhythm customizations, multiplayer synchronization, DAW integration, allowing them to focus on what matters – their music. The watch also comes with the company’s original metronome app. The main advantage of a metronome that vibrates rather than clicks is that it can be used in even the noisiest of environments. The watch’s 7G ERM Motor generates vibrations that are 7 times stronger than on a typical smartphone. At the same time, the outer LED ring flashes to the beat, keeping you in time both visually and by feel. The on-device controls allow you to customize everything, including the tap tempo, time signatures, subdivisions and accents. This functionality extends to the removable tuner ring, which magnetically attaches to stringed instruments such a guitar, bass, ukulele and violin. A built-in Piezo mic detects micro-vibrations from the strings and lets you tune your instrument in any environment, no mater how loud or dark. You can choose pitch frequencies between 430hz and 450hz in 1 hz increments. Soundbrenner Core also features a decibel meter. This aims to protect the musician’s most important tool – his hearing! The Core will stay vigilant alerting you to potentially harmful volume levels. “Today’s music tools are so bad, that we don’t use them as often as we should, ultimately making us worse musicians,” said Soundbrenner’s Florian Simmendinger. Soundbrenner Core comes in two models with distinctive looks but the same tools and features. One is made of high-quality polycarbonate and aluminum, and the other (Core Steel) out of pricier stainless steel and leather. Both are resistant to the occasional splash but are not swim-friendly. There are also interchangeable straps allowing you to customize the watch to your liking.